]'m opening this thread so I can report minor issues/oversights that I've seen in 1.3, including the betas. If anyone else spots things like this, feel free to throw them up as well. -Tracking missiles locked onto a station (eg. Sung Turret) will continue to track that target when it is destroyed, while tracking missiles targeting a ship will lose their lock and revert to a straight-line attack when their target is destroyed. This could be changed for consistancy, but does not impact the game much (besides accidental destructions caused by those stray missiles). I suspect this is because stations simply change their state when destroyed, whereas ships are actively replaced by a brand new object. Setting missiles to automatically swap to the new target might work to fix this, if deemed necessary. -Blacklisting could really use a "are we in the middle of a massive fight" check. It's not fun fighting off an entire xenophobe fleet only to find that the corporate trade post has decided to blacklist you because a single stray shell hit something important. -Some weapons (eg. Advanced tritium cannon) are virtually impossible to sell because of their high prices. -Single Mk.3 howitzer can be enhanced with a makayev enhancer, but the dual version cobbled together by the Tinkers cannot. -Digital Wrist Computers are produced in large quantities by factories, but are almost impossible to sell at all, let alone at a profit. *I think this takes the prize for 'Bug report I least expected to write". Last edited by Song on Thu Jul 03, 2014 2:41 am, edited 1 time in total. Microsaur is a luxury item, and Sisters accept luxury items in exchange for more attitude points. Not as efficient as other items like fuel, though. Bottom line, working as intended, apparently. I'm aware of this. It's still bizarre and makes no sense. -Ranx Dreadnoughts will happily shell their own fortress into oblivion if the player is sitting on top of it. -Dvalin's Manufacturing Plant, where he developed the Ion9, does not have the ability to install it. -Tundra gunships attacking a scarab for a fleet mission will fly so close that it's almost impossible to hit them without killing the freighter. Some standoff distance would be useful. -Britannias on a fleet mission will not fire at nearby targets when ordered to wait. This ability would be awesome if it could be ported to autons and other wingmen, and made available only on demand. Particle-type weapon effects change the direction of the particles based on the motion of the ship. To test: Install an Ion9. Point the ship facing downards, with no motion. Fire it, and observe (using the frame-by-frame on pause) that the lines of ion energy are parallel to the direction of travel. Now, turn to the right and accelerate up to top speed (best done with a fast ship like a wolfen or enhanced sapphire). Turn to face downards while coasting. Fire again. The fire effects will be angled in the direction the playership is travelling. I do not know if this is a bug, or working as intended. -Shot effect from ion9 does not line up with actual damage: the weapon can actually damage a target immediately behind the player when fired. To test: Line up right next to a hostile station, and fire the gun away from the station. You'll see hit effects behind you. This might also explain why the ion9 seems to be pretty horrible at point-blank range, but excellent at a distance. -Rama refuses to kill hostile luminous drone on "Attack target" order, claiming it is "innocent". This is all from one random encounter with luminous, immediately after I got myself a CPU and some programs to try out. Dying with insurance with damaged patch spiders installed will result in those devices being fully repaired on the replacement ship. This means that if you know you're going to die, you can repair every single patch spider you've looted in horrible condition from the Ranx in the process, assuming you've previously purchased insurance. Got a couple as well. I rushed through the entire game to see how fast I could get to Heretic just by flying gate-to-gate, and when docking with the Antarctica I get the usual dialogue with Captain Helios (I never joined the Militia or Fleet and don't even have an ID). It should default to the "This is a military ship, civvie!" that you get on other CSCs. 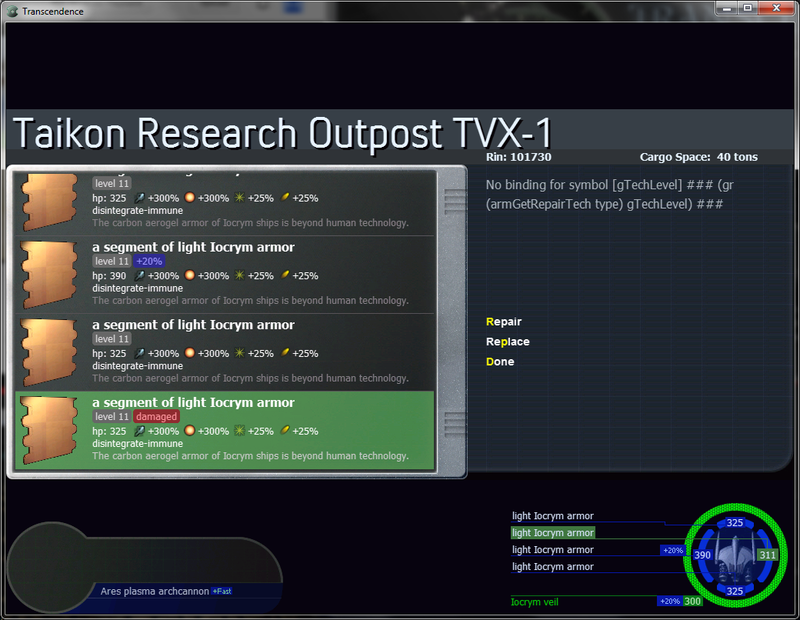 Also I got an error when repairing armor at the Taikon station in Heretic. 07/08/2014 18:06:08	Loading user collection. 07/08/2014 18:06:10	All resources downloaded. 07/08/2014 18:06:19	Starting new game. The "unable to save game" thing indicates there's an issue. it may be caused by the SM&M+ mod, which still isn't entirely brought up to the current API system. If this happens again, I'll test it some more. -Saved and exited a game. Menu cycled through tracks on the OST at a rate of ~3Hz without playing any of them. Game started to hang up, but responded well enough to exit. Restarting the game did not cause the issue to reoccur. -Observed an earthzone class shuttle trying to attack a scavenger. It was flying around and around the scavenger, not shooting at all. May be caused by being unable to turn fast enough to hit it, or some AI derpyness. EDIT: I fired some recoilless rounds at it, and took the shield down to force a retreat. When it returned, it resumed orbiting....but ironically, it's now being followed by a pair of Corsair I's. Which have the same problem: they're following it, but can't hit it. I'm thinking about modding Yakety Sax into the game now. Suggested fix: make the AI loop outwards and attack from a distance if they can't close to a firing angle at close range, or keep going in circles. Edit2: After a few minutes, the scavenger docked at a wreck, causing the earthzone to take a direct attack path. It then got turbolasered. So any AI issue is mostly related to slow-moving targets. Shouldn't that Novaya Armor Repairer be listed on the right-side to keep all the information visible? If not, then, shouldn't the listing be scrollable (what happens if two devices are installed that show up on the left, then the player would not even see how many device slots are available)? [EDIT] Atarlost pointed out that you can scroll down, but it's undocumented (I tried with the mouse wheel, nothing happened, so I thought you couldn't, then after talking to Atarlost, discovered it scrolled with the keyboard, only), and it's not obvious in the screen (perhaps some kind of indicator on the side or bottom would help to tell the player that there is more information below). There are several places (like this) where it would be logical to use the scroll wheel on the mouse to scroll through stuff, as you're using the mouse to do things already (like picking your ship in this case, or scrolling through a list of items in a dock screen), but you have to keep switching between mouse and keyboard. Another logical place where the mouse would be useful would be when displaying the map (mouse wheel to zoom, click-and-drag to to scroll the map when zoomed in, right-click to re-center on the player). Okay, this seems to be rather an oversight, but, why do Residentials have the commonwealthCustoms attribute? It would not be logical (to me) that an apartment station would have customs agents waiting to nab potential smugglers and drug dealers (or, for that matter, even metal detectors). Then again, I guess we're dealing with space, and it could be a totally paranoid society (like in The Fifth Element), but, still, it's like having customs agents at every apartment building in a port city - would customs have the manpower for that? Who would pay to have them, and their detectors, there (certainly not the Residential or Habitat)? I was following the Benedict story arc, he sent me to a residential station to help them. I went and destroyed the Centauri station they sent me to, looted the station, whereupon I collected 6 Laudanum Ampules. Upon my return to collect my reward from the residential station, I'm accosted by customs and the Laudanum confiscated, with no indication that I should have sold it, or where. It would have been nice, since this is part of the tutorial, if, upon returning to the station, someone had pulled me aside and whispered to me that I might want to check out the Maintenance Level of a Corporate Enclave in the area (not necessarily giving away what exactly to do - after all, once you go there, it should be obvious if you read the description, what to do there), before doing anything else (the same would be good, if the Sisters of Domina were our destination after killing the second Centauri station - Benedict ought to suggest a visit to the Maintenance Level of a nearby Corporate Enclave before going on the next part of my training or mission).